The media love affair with Al Gore continues. 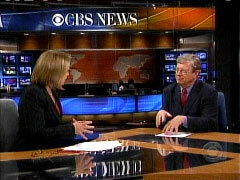 Thursday night, after Gore delivered a speech calling for the end of "carbon-based fuels" within ten years, CBS anchor Katie Couric asserted that "as many as 10 million families could have their electricity shut off this year because they simply can't pay their bills," but, she assured viewers, "Al Gore says there is a green answer." Reporter Nancy Cordes then trumpeted: "The man who has cast himself as the country's environmental conscience issued an audacious dare to America's next President." Cordes concluded with how "both Barack Obama and John McCain accepted Gore's challenge. As McCain put it, Katie, if the Vice President says it's doable, I believe it's doable." Introducing her interview with Gore, which she traveled to Washington, DC to conduct, Couric hailed: "Al Gore laid down a green gauntlet today." And she couldn't resist reminding viewers that Gore's "environmental work earned him a Nobel prize" before she helpfully cued him up on energy policy: "It really is multi-tiered, isn't it? I mean, it's a national security issue, it's an environmental issue." Couric soon moved on to pushing Gore about accepting the VP slot or at least "being, say, an environmental czar" in Obama's administration. A question from Katie Couric on Wednesday night illustrated how members of the media will use lack of majority support amongst whites for Barack Obama to raise potential racism. Citing a new CBS News/New York Times poll in which Obama leads McCain by 45 to 39 percent overall, Couric pointed out "it showed that John McCain had a slim lead over Barack Obama" (by 46 to 37 percent) with white voters so, she wondered: "Is there any way to determine if race is playing a role in those numbers at all?" She didn't mention how Obama leads McCain by a near-unanimous 89 to 2 percent amongst blacks. Jeff Greenfield undercut her premise: "I really don't think so. White voters have tended to vote Republican for the last 44 years." The night before, July 15, Greenfield noted: "Obama does trail among whites by nine points, but remember John Kerry lost the white vote by nearly twice that margin in 2004." And yet a day later Couric saw racism. In Greenfield's Wednesday night CBS Evening News story, he featured liberal professor and blogger Michael Fauntroy who contended John McCain spoke to the NAACP in order to appease "Republican moderates" who "do not feel comfortable being associated with a party that's known as hard right." What "hard right" party? Morning Joe host Joe Scarborough slammed the "hacks" at Comedy Central's Daily Show on Wednesday for only making fun of Republicans and giving a free pass to Democrats. Discussing a July 15 New York Times piece that described how TV comics and talk show hosts are hesitant to make fun of Barack Obama, Scarborough mocked: "I never want to hear anybody from 'The Daily Show' or any of these other shows ever saying again, 'We speak truth to power.' 'Cause you know what they do? They speak truth to Republicans." After admitting that Republicans have made many mistakes over the last seven years, the MSNBC host continued to eviscerate the crew at the The Daily Show and others: "But, please, don't be subversive, because you're not. Because you're a hack. You're a hack for the Democratic Party and you only tell jokes about one side." New York Times journalist John Harwood, appearing on the program as a guest, attempted to stick up for the comics by justifying, "I don't think they are hacks for the Democratic Party. People write about what's funny to them. And the stuff that's funny to them is, is the stuff that comes out of what they see that they want to make fun of from Republicans." Do not say black and white Americans live in the same world or you will feel the wrath of Whoopi Goldberg. That is what Elisabeth Hasselbeck discovered on Thursday's edition of The View on ABC. Upon suggesting that, Whoopi reduced Elisabeth to tears. On the news of Jesse Jackson's use of the "n" word, the conversation quickly developed into the double standard involved between a white and black person's use of the word. Sherri Shepherd and Whoopi Goldberg admitted there is a double standard, but argued there should be. Sherri Shepherd said she uses the word "as a term of endearment," but said to Barbara Walters "I don't want to hear it coming out of your mouth." Hasselbeck, puzzled by the obvious double standard, questioned how she can explain to her young daughter why she is not allowed to use that word, but other kids are. When she noted "we live in the same world," Goldberg went off on a tangent that blacks and whites do not live in the same world. Goldberg, who also dismissed Elisabeth Hasselbeck's concerns as "very white," contended Hasselbeck just does not "understand." Hasselbeck then started to cry. Walters used the opportunity to promote Obama's candidacy: "Barack Obama and others...are trying to move forward." The media love affair with Al Gore continues. 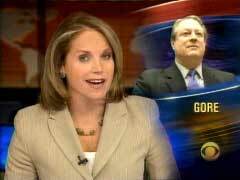 Thursday night, after Gore delivered a speech calling for the end of "carbon-based fuels" within ten years, CBS anchor Katie Couric asserted that "as many as 10 million families could have their electricity shut off this year because they simply can't pay their bills," but, she assured viewers, "Al Gore says there is a green answer." Reporter Nancy Cordes then trumpeted: "The man who has cast himself as the country's environmental conscience issued an audacious dare to America's next President." Cordes concluded with how "both Barack Obama and John McCain accepted Gore's challenge. As McCain put it, Katie, if the Vice President says it's doable, I believe it's doable." Introducing her interview with Gore, which she traveled to Washington, DC to conduct, Couric hailed: "Al Gore laid down a green gauntlet today." And she couldn't resist reminding viewers that Gore's "environmental work earned him a Nobel prize" before she helpfully cued him up on energy policy: "It really is multi-tiered, isn't it? I mean, it's a national security issue, it's an environmental issue." Couric soon moved on to pushing Gore about accepting the VP slot or at least "being, say, an environmental czar" in Obama's administration. "Our Planet," fill-in NBC anchor Ann Curry teased,"Al Gore's ambitious energy plan for America off fossil fuels within ten years. Is it possible?" Reporter Ann Thompson celebrated how Gore "threw down the gauntlet to the nation to dramatically change the way America generates electricity." After reporting Gore's plan would cost $3 trillion, Thompson called Gore "undaunted" and concluded: "And he says the time to move is now." In the Cordes piece on the CBS Evening News, she turned to a liberal to confirm Gore's wisdom: "Is this a realistic goal or is it pie in the sky?" Tyson Slocum of the far-left Public Citizen insisted: "Oh, no, it's very realistic." Cordes then offered this innocuous description of him: "Clean energy advocate Tyson Slocum." ABC's World News limited coverage on Thursday night to a summary of his call to end fossil fuel use and a brief excerpt from Claire Shipman's interview with Gore (a soundbite of Gore explaining the futility of more offshore drilling), but Friday's Good Morning America will show no such restraint and air much more of the interview. Appearing with Today news reader and Dateline anchor Ann Curry during NBC's prime time coverage Saturday of Al Gore's "Live Earth" concerts, Gore gave a shout out to the network for its donation to his global warming cause, as Gore told Curry: "Thanks for what NBC has been doing." Curry didn't exactly deliver a hard-hitting interview. When Gore declared the concerts "the largest global entertainment event in all of history," she congratulated him before pressing him about running for President, suggesting that "without you there will not be the political will in the White House to fight global warming." She pleaded: "A lot of people want me to ask you tonight if you're running for President. And I know what you're answer is gonna be, believe me. I gotta ask you though. After fueling this grass roots movement, if you become convinced that without you there will not be the political will in the White House to fight global warming to the level that is required, because the clock is ticking, would you answer the call? Would you answer the call, yes or no?" "He was once called 'Mr. Stiff.' Now he's known as 'The Goreacle,' the new Al Gore," CBS Evening News anchor Katie Couric touted in plugging an upcoming Friday night story. 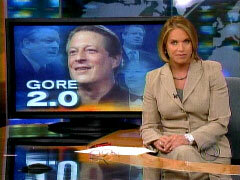 With "Gore 2.0" on screen, Couric set up the subsequent tribute by asserting that "no one's getting more attention than the latest edition of Al Gore. 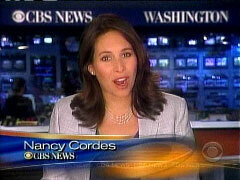 Sharyn Alfonsi reports on Gore 2.0." Attention from the media, certainly. Alfonsi trumpeted how "Al Gore seems to have gone from awkward to almost slick," proposing that "all it took was eight years, some melting polar ice caps and an Oscar win for his documentary." KATIE COURIC: Americans can certainly use some relief. And it's not just gasoline but all energy prices. The percent of our income we spent on energy has been rising steadily this century to nearly 7 percent, the highest in nearly two decades. As many as 10 million families could have their electricity shut off this year because they simply can't pay their bills. 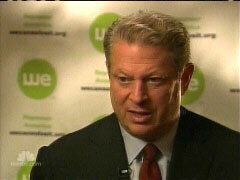 A red flag, but Al Gore says there is a green answer. NANCY CORDES: The man who has cast himself as the country's environmental conscience issued an audacious dare to America's next President. AL GORE: -so today I challenge our nation to commit to producing 100 percent of our electricity from renewable energy and truly clean carbon-free sources within 10 years. CORDES: That would mean fully replacing all the coal and natural gas that currently power America's electric grid with wind, solar, and other earth-friendly energy sources by 2018. Is this a realistic goal or is it pie in the sky? 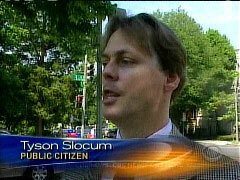 TYSON SLOCUM, PUBLIC CITIZEN: Oh, no, it's very realistic. CORDES: Clean energy advocate Tyson Slocum says record energy prices present a unique political opportunity. SLOCUM: I think Congress has already been trying to pass bills that would start the building of our alternative energy infrastructure. It's clear that the future of energy is not with fossil fuels. CORDES: And they're burning a hole in America's pocketbook. Skyrocketing oil prices have driven the cost of gasoline up 39 percent in the past year, and heating oil up 42 percent. While rising coal and natural gas prices have pushed propane up 28 percent and electricity up nearly 4 percent with the worst still to come. MARK WOLFE, NATIONAL ENERGY ASSISTANCE DIRECTOR'S ASSOCIATION: Well, we're looking at this coming winter, really it's different from previous years. Energy's always been expensive in poor families, but now it's hitting the catastrophic point. CORDES: In Chicago, 72-year-old Annie McTizic has stopped using her AC, her TV, even her radio to save electricity. But she still faces shutoff next week. ANNIE MCTIZIC, CHICAGO RESIDENT: There's no way I could possibly pay that bill that big, you know? I cannot pay that bill. CORDES: But the kind of energy overhaul proposed by the former Vice President doesn't come cheap, either, as he acknowledged in his interview with Katie Couric. COURIC: Your own group says, Vice President Gore, it will cost between $1.5 trillion and $3 trillion. GORE: But once we built it, the fuel is free. The sunshine and the wind are here. China can't bid up the price. It's not going to run out. So we need to switch to a new system. CORDES: This afternoon, both Barack Obama and John McCain accepted Gore's challenge. As McCain put it, Katie, if the Vice President says it's doable, I believe it's doable. KATIE COURIC: As we told you earlier, Al Gore laid down a green gauntlet today, challenging the nation to produce all our electricity from renewable sources -- like windmills and solar panels -- and do it within 10 years. Here in Washington today, I spoke one on one with the former Vice President whose environmental work earned him a Nobel prize. He acknowledges his plan would cost as much as $3 trillion. Vice President Gore, let me just ask you about this challenge you put forth today, to briefly explain what prompted you to do this. Why? AL GORE: We've got to end our dependence on oil and coal. They're rising rapidly in price. That's why gasoline prices are going up, and it's why electricity rates are going up. But the new demand for oil and coal from China and these other fast-growing countries means that the only way we're going to escape the rising prices and the dependence on foreign sources is by switching to renewable sources. GORE: I think it is because there's some challenges '€" think of the Apollo program, the interstate highway system. There's some challenges that are really important to the future of the country that can't be done in a single year or two years. GORE: I think we're getting there. I don't think it's there on Capitol Hill. I don't think it's there in the White House. I think it's beginning to build pretty steadily among the American people. People are really hurt by these high gasoline prices, and people have caught on after 35 years to the fact that simply producing more oil does not bring down the price of gasoline. COURIC: It really is multi-tiered, isn't it? I mean, it's a national security issue, it's an environmental issue. GORE: Yeah. One of the reasons why our country's had such a hard time dealing with this is it does involve national security, energy, the economy, and the environment. But there's a common thread that runs through all of it. The key is ending our dependence on carbon-based fuels. And if we grab a hold of that thread and pull it, the other problems begin to unravel, and we've got the answer right in our hands. It's to switch over from carbon-based fuels to renewable energy. COURIC: Are you impressed, Vice President Gore, by Senator McCain's commitment to the environment? GORE: I think he deserves credit for having taken leadership positions in years past at a time when it was hard for people in his party to do that. COURIC: Senator Obama said during the primary season there would be a place at the table for Al Gore in an Obama administration. GORE: Well, that's a very nice thing for anybody to say and I appreciate it. I would not take a formal position in any administration. GORE: Well, it's a really nice idea. I don't think that's the best way for me to serve my country. GORE: I have many times said -- you know, I have a personal term limit. 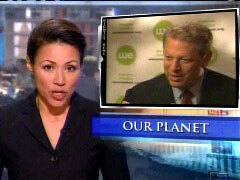 ANN CURRY, TEASE: Our Planet: Al Gore's ambitious energy plan for America off fossil fuels within ten years. Is it possible? ANN CURRY: Back to oil, former Vice President Al Gore, who shared the Nobel Peace Prize for his efforts to fight global warming, says it is time for Americans to break their dependence on oil. Today he's out with a long-term plan, and he's comparing it to the effort to put a man on the moon back in the 1960s. 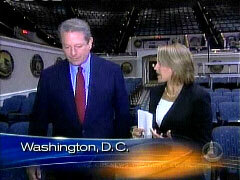 NBC's chief environmental affairs correspondent Anne Thompson talked to Al Gore today. ANNE THOMPSON: With all the trappings of a campaign rally, today, Al Gore threw down the gauntlet to the nation to dramatically change the way America generates electricity. AL GORE: Today, I challenge our nation to commit to producing 100 percent of our electricity from renewable energy and truly clean carbon-free sources within 10 years. THOMPSON: How do we reach that goal? 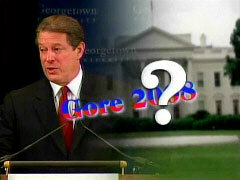 GORE: Well, some parts of our energy system are harder to change than others. But the quickest and easiest place to introduce renewable energy -- like solar power and wind power, geothermal energy -- is in the generation of electricity. THOMPSON: But you didn't mention cost in your speech, and I understand that what you're talking about is up to a $3 trillion investment over 30 years. GORE: It's an investment worth making because we cannot continue being so dependent on expensive foreign oil and dirty coal when both are rising in price. THOMPSON: But how do you convince an American public to spend trillions of dollars on clean energy? GORE: Because that's the way to get a reduction in energy costs because the fuel that we use now, oil and coal, is very expensive and getting more expensive. The fuel that we use for renewable energy is free. THOMPSON: The country would have to spend billions building transmission lines and upgrading the grid. So this renewable energy could travel from wind farms on the Texas plains and solar plants in the Nevada Desert to the cities and towns that need it. Gore is undaunted. GORE: When enough people share the passionate conviction that we have to solve the climate crisis, then the political system will shift into high gear and move quickly. THOMPSON: And he says the time to move is now. 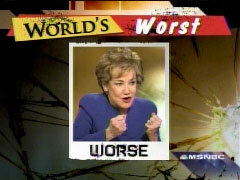 Anne Thompson, NBC News, Washington. A question from Katie Couric on Wednesday night illustrated how members of the media will use lack of majority support amongst whites for Barack Obama to raise potential racism. Citing a new CBS News/New York Times poll in which Obama leads McCain by 45 to 39 percent overall, Couric pointed out "it showed that John McCain had a slim lead over Barack Obama" (by 46 to 37 percent) with white voters so, she wondered: "Is there any way to determine if race is playing a role in those numbers at all?" She didn't mention how Obama leads McCain by a near-unanimous 89 to 2 percent amongst blacks. Jeff Greenfield undercut her premise: "I really don't think so. White voters have tended to vote Republican for the last 44 years." The night before, July 15, Greenfield noted: "Obama does trail among whites by nine points, but remember John Kerry lost the white vote by nearly twice that margin in 2004." And yet a day later Couric saw racism. 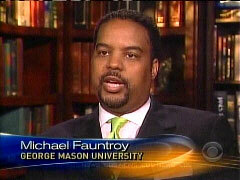 In Greenfield's Wednesday night CBS Evening News story, he featured liberal professor and blogger Michael Fauntroy, nephew of former DC federal delegate Walter Fauntroy, who contended John McCain spoke to the NAACP in order to appease "Republican moderates" who "do not feel comfortable being associated with a party that's known as hard right." What "hard right" party? I wish there still was one. 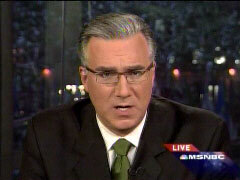 Olbermann teased his "Worst Person" segment during the opening of the first show after the end of his vacation: "'Worsts' is back. Elizabeth Dole wants to name an AIDS funding bill in memory of Jesse Helms, who believed gay people deserved the disease." During a plug before a commercial break at 8:45 pm EDT, the MSNBC host called Helms a "homophobe": "And in 'Worsts,' the Senator who thinks an AIDS bill should be named after homophobe Jesse Helms." Morning Joe host Joe Scarborough slammed the "hacks" at Comedy Central's Daily Show on Wednesday for only making fun of Republicans and giving a free pass to Democrats. Discussing a July 15 New York Times piece that described how TV comics and talk show hosts are hesitant to make fun of Barack Obama, Scarborough mocked: "I never want to hear anybody from 'The Daily Show' or any of these other shows ever saying again, 'We speak truth to power.' 'Cause you know what they do? They speak truth to Republicans." After admitting that Republicans have made many mistakes over the last seven years, the MSNBC host continued to eviscerate the crew at the The Daily Show and others: "But, please, don't be subversive, because you're not. Because you're a hack. You're a hack for the Democratic Party and you only tell jokes about one side." New York Times journalist John Harwood, appearing on the program as a guest, attempted to stick up for the comics by justifying, "I don't think they are hacks for the Democratic Party. People write about what's funny to them. And the stuff that's funny to them is, is the stuff that comes out of what they see that they want to make fun of from Republicans." Proving Scarborough's point that Stewart is no brave figure who speaks truth to power, the NYT chief Washington correspondent observed: "It's not that they are trying to serve a political agenda, it's what is it that moves them?" Scarborough rebuffed this whole line of thinking by stating: "Which means, and we all know this is the case, that on the The Daily Show and other shows like this, they only have people with one world view." Mika Brzezinski, the resident liberal co-host on Morning Joe, offered a not-so-vague warning to anyone who would dare crack jokes about Obama: "But my point is that there are layers of what's politically correct and layers of what potentially could incite the wrong things." She want on to boldly claim that it's simply very hard to make fun of the Democratic contender: "When have you a candidate who is black and who has a name people have made fun of and have bad information on the internet on, I think there are layers here that present really great challenges." SCARBOROUGH: I just -- I never want to hear anybody from 'The Daily Show' or any of these other shows ever saying again, 'We speak truth to power.' 'Cause you know what they do? They speak truth to Republicans. Republicans are funny. They have been idiots and jackasses over the past seven years. But, please, don't be subversive, because you're not. Because you're a hack. You're a hack for the Democratic Party and you only tell jokes about one side. BRZEZINSKI: Joe -- No, this is not about being in the tank. HARWOOD: No. Well, but hold on a second. I don't think they are hacks for the Democratic Party. People write about what's funny to them. And the stuff that's funny to them is, is the stuff that comes out of what they see that they want to make fun of from Republicans. That's what -- It's in the same way that if you are a columnist or if you are a commentator, it's much easier to whack the other side than to be sharp about your own side. SCARBOROUGH: They have one world view, Mika. They have one world view at The Daily Show. 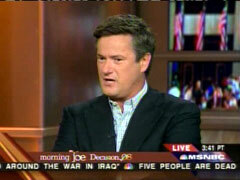 SCARBOROUGH: Oh, you don't, you don't think they have made fun of Condi Rice? HARWOOD: Not that they've never made fun of Barack Obama, either. I think there's a filter applied to them as well. I mean, you can't say there's no difference between the dominant group in society and the not dominant. SCARBOROUGH: -of Condoleezza Rice. No, from mainstream people. Where nobody even brought it up. Nobody was even concerned. I'll guarantee you Condoleezza Rice noticed. Do not say black and white Americans live in the same world or you will feel the wrath of Whoopi Goldberg. That is what Elisabeth Hasselbeck discovered on Thursday's edition of The View on ABC. Upon suggesting that, Whoopi reduced Elisabeth to tears. On the news of Jesse Jackson's use of the "n" word, the conversation quickly developed into the double standard involved between a white and black person's use of the word. Sherri Shepherd and Whoopi Goldberg admitted there is a double standard, but argued there should be. Sherri Shepherd said she uses the word "as a term of endearment," but said to Barbara Walters "I don't want to hear it coming out of your mouth." Elisabeth Hasselbeck, puzzled by the obvious double standard, questioned how she can explain to her young daughter why she is not allowed to use that word, but other kids are. When she noted "we live in the same world," Goldberg went off on a tangent that blacks and whites do not live in the same world. Goldberg, who also dismissed Elisabeth Hasselbeck's concerns as "very white," contended Hasselbeck just does not "understand." Hasselbeck then started to cry and asked "how are we supposed to then move forward if we keep using terms that bring back that pain?" Barbara Walters used the opportunity to promote Obama's candidacy, opining: "Barack Obama and others...are trying to move forward." WHOOPI GOLDBERG: I don't know whether you've been watching television last night or this morning, but new footage was leaked that apparently shows Jesse Jackson using the "n" word. Fox News says the tape was leaked. They didn't have anything to do with it. So I ask you, is any of this a surprise? SHERRI SHEPHERD: Well, you know, what, what I think the hypocrisy is coming out because Jesse is the main, he was the main proponent of, of saying, you know, he didn't want the rappers using it and take it out. And I thought, and we were talking about it, I thought it had been a funeral or something where they'€" I don't know if Jesse came to the funeral'€" where they buried the "n" word. SHEPHERD: Was that Al Sharpton? HASSELBECK: Jesse was part of that as well. JOY BEHAR: He wasn't talking about using the word privately. He was talking about using it publicly. HASSELBECK: Did you ever see Crash? Did you guys see Crash the movie? See I don't think there's an ounce of difference, and sometimes I think it's almost worse to talk, use it privately than publicly. SHEPHERD: No, no, it's not true, no. SHEPHERD: Don't tell me I can't use that word. Because I use it. BARBARA WALTERS: Okay, there's something I want to add. HASSELBECK: But how is it, you're telling me I can't use it, but you can use it. WALTERS: That's what I want to ask you. SHEPHERD: There's no difference from being funny. WALTERS: Could I just ask a question? HASSELBECK: I would never use it to begin with, but yes. GOLDBERG: Then why are you arguing? HASSELBECK: I'm saying why is it for anyone to say it? WALTERS: Elisabeth could I just ask a question? WALTERS: Is it -- and what you're saying, is it okay for black comics primarily, like yourself when you do an act and so forth, is it okay then to use as it is still done and not okay for white people? Is that the case? SHEPHERD: Yeah I, I have no problem with them using it. It's something that means something way different to me than it does to you. I grew up with my family using it. It, for me, I can use it as a term of endearment. SHEPHERD: I don't want to hear it come out of your mouth. HASSELBECK: It's an example. I'm just giving an example. HASSELBECK: I am not trying to. GOLDBERG: No, no, no, listen to me, listen to me. Just like you can talk about comical Italian people if you were a comic. GOLDBERG: And yeah, so you can say all kinds of stuff. You can say the stuff that your mom and dad would say in the privacy of their home and not outside. That's just the way that it works. SHEPHERD: What about teaching, what about teaching Grace with different things that. There are some things where people are sensitive to. There are some things that we can't say because people are sensitive to it. Kids say "why does that person have a hump on their back?" You know, that might hurt their feelings. So why not explain it in that way? HASSELBECK: Look, I'm not saying I won't explain to my daughter how to talk about words. I grew up in a household where we didn't say, I'm half Polish and half Italian. If somebody said to me "you're a dumb Pollack," it offended me. I never made fun of myself saying, you're, you're that word. I'm a this. I never would go into my own heritage and use a phrase that is used against me in the privacy of my own home because I think it perpetuates stereotypes and hate. GOLDBERG: You have to understand [bleeped out] word that has followed us around, and basically what we did is we took it out the hands of people that were using it and put it into our hands and we use it the way we want to use it and that's the way it is. HASSELBECK: Then it sneaks into pop culture then. I'm just trying to get an answer. WALTERS: -it's okay in her culture, but it is difficult as you as a white mother to explain that, that Jeffrey can use it, but Grace can't. HASSELBECK: It's not difficult for me. It's just an example in terms of general philosophy. I have no problem explaining things to Grace. My thing is that we don't live in different worlds. We live in the same world. GOLDBERG: We do live in different worlds. I'm sorry. I'm sorry it's the way it is Elisabeth. This is the way it is. This is how I grew up. My mother could not go and vote in the United States of America, the place of her birth. We, go, wait, wait. WALTERS: And don't we want that to change? GOLDBERG: Yes, we would like to. But you don't understand. HASSELBECK: I'm not going to take that away from no. GOLDBERG: No, no, I, I want you to. But what I need you to understand is the frustration that goes along when you say we live in the same world. It isn't balanced. And we would like it to be. But you have to understand, you have to listen to the fact that we're telling you, there are issues, there are huge problems that still affect us. And you've got to know this if you want to know us. GOLDBERG: But it didn't sound like it. WALTERS: Okay, just take a breathe and let someone else talk. HASSELBECK: I am, I am, but this is a conversation that is hard and we're going to have it here and we have it here for a while because we love each other. When we live in a world where pop culture then uses that term, and we're trying to get to a place where we feel like we're in the same place and we feel like we're in the same world, how are we supposed to then move forward if we keep using terms that bring back that pain? GOLDBERG: I can tell you. HASSELBECK: But when is it time to have the conversation? WALTERS: Okay, but one second, let somebody else have a conversation for just one second. [laughter] We have a man- [laughter and applause] We have a man running for President who is 50 percent white and 50 percent black. And one of the things that he is trying to do is to bring people together and there still is racism. I have not heard anybody on this show say the word that you just said. They say the "n" word, we're so afraid of it. If I said what you said, I would never hear the end of it. But when, wait I'll grant it. But when you say it's okay, we are trying to change. This is what Barack Obama and others are trying to do, to move forward. In the meantime, we have to understand that we haven't gotten there yet. And maybe we should and maybe it's not okay for you to use the word, but that is the reality, that's the reality of the moment. And whether it's a good thing or a bad thing. BEHAR: Is this segment over? Because I can just end it right now. SHEPHERD: You haven't said anything. WALTERS: No, you can say something.